I’ve been thinking of ways of using up odds and ends of vegetables. Freezing is one option, but another is lightly pickling them. Fridge pickles, simpler to make than proper pickles, but meant to be stored in the fridge rather than left on a cupboard shelf. I’ve used radishes in this recipe (as that’s what I had to hand), but this would work nicely with carrots, turnips or even cauliflower florets. I’ve based my recipe on this one. It would be possible to add some different spices to mix up the flavour a little. Add the liquid ingredients to a small saucepan and bring to the boil. Add in the salt, sugar, ginger and chilli. Simmer for a few minutes until the sugar and salt have dissolved. Put the radishes in a sealable jar or box. Pour the hot liquid over them. Leave to cool and then put in the fridge. Give it 24 hours before eating them. Serve as a snack or as an accompaniment to dals, curries or salads. 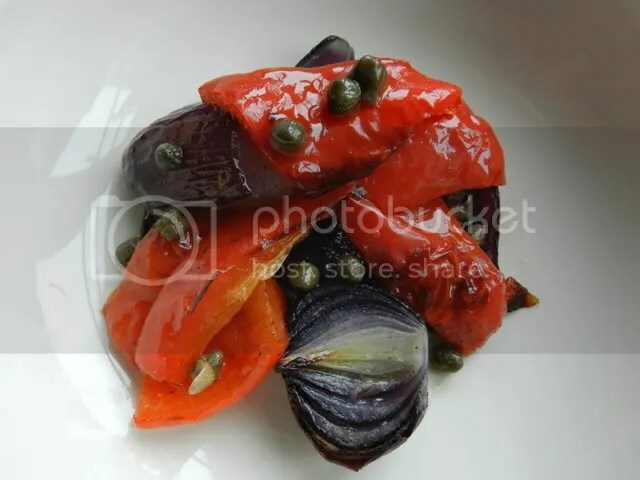 This is another recipe from Veggiestan. It caught my eye as being an unusual combination of yellow split peas and carrots, which is not something I’d ever thought of putting together before. 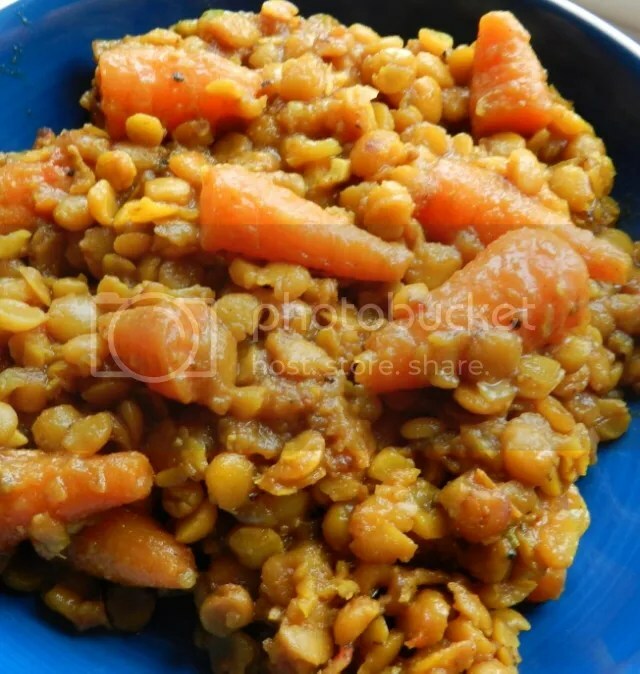 I was also a little sceptical as to whether unsoaked yellow split peas would cook before the carrots turned into mush. Well I was wrong, the peas are cooked through and the carrots are tender, but hold their shape. The spicing is light with this recipe, the chilli just adds a background heat and the vinegar lifts the flavours. There’s not much prep involved in this recipe and it cooks in an hour, it could just be a winner on a cold, rainy winter’s evening. Heat some oil in a large saucepan and add the onion. Soften for a couple of minutes and then add the garlic, ginger and chilli. Stir for a few more minutes and then add the spices and stir until they have all mixed in with the oil. Add the carrots, split peas, tomato puree, tomatoes and the vinegar. Add the vegetable stock, this should just cover the mixture. Bring to the simmer, then cover and simmer for 60 minutes. Check every so often to make sure it’s not catching on the bottom of the pan and add some boiling water if it is getting too dry. Serve with rice and some mango chutney on the side. Mr Hamilton: Could you make me a Waldorf salad. Basil Fawlty: Oh… a… Wa…? Basil Fawlty: I think we’re just out of Waldorfs. You might think that a salad invented at the great Waldorf Hotel in New York would be complicated, but it isn’t. 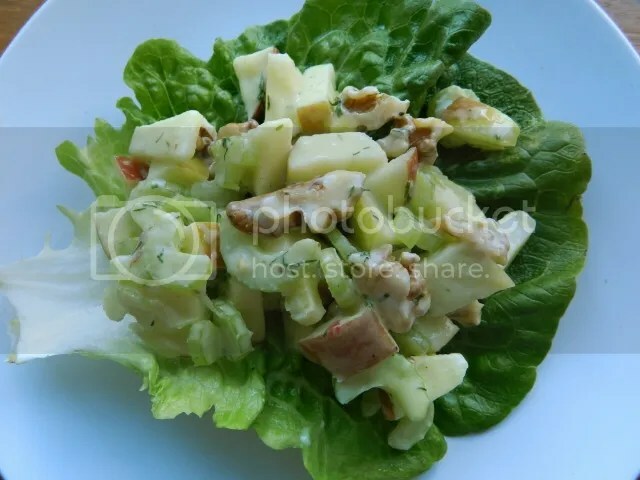 Its classic recipe has only four ingredients – celery, apple, walnuts and mayonnaise. I’ve messed about with is slightly, but only by adding a touch of flavour to the mayo. And while we’re on the subject, please don’t put too much mayonnaise in this. I hate it when you have to spade your way through the dressing to find the salad ingredients. A light coating is all that’s needed. This is a lovely, refreshing starter that’s simple and quick to make. Add the mayonnaise to a largish bowl, stir in the mustard and dill. If you have enough time, let them stand for about 10 minutes to let the dill flavour develop. Just before serving chop the celery, apple and walnuts and stir into the mayonnaise. This is a recipe from my new favourite recipe book Veggiestan by Sally Butcher. Now, I will be posting a proper review of the book later on, but I wanted to try a recipe before I did so. It wasn’t going to be this one, to be honest, there’s a recipe for carrots and yellow split peas from Afghanistan I wanted to try. However, that takes two hours to cook and today, real life intervened, cutting down the time I had for cooking. 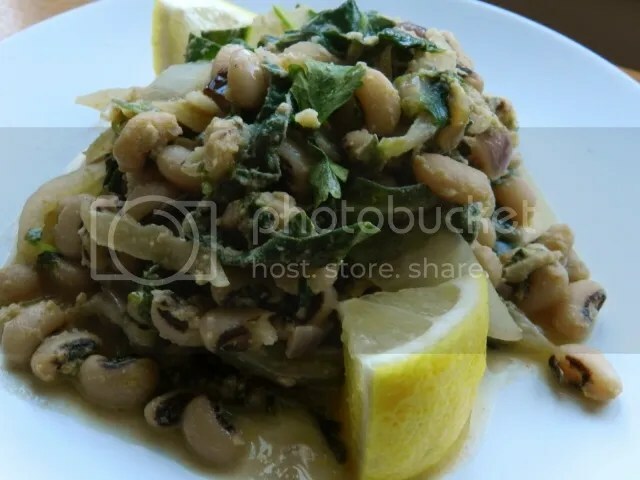 This recipe uses black-eyed beans (or peas) which cook much quicker. And I had some swiss chard in the fridge, so this seemed an obvious choice. The original recipe calls for a leek but I didn’t have one, so I substituted a sweet, red onion instead. This is a lovely recipe, I think any dark green leaf would work if you didn’t have swiss chard to hand. You could also substitute the pulse part as well – chickpeas would be nice here, I think. Cook the beans in boiling water for about 40 minutes or until tender. When they are nearly cooked, heat a generous glug of oil in a large pan. Add the red onion to the oil and soften for a couple of minutes. Stir in the chard stalks and cook for a couple of minutes. Add the chard leaves, the nutmeg, chilli powder and coriander. Stir for a couple of minutes. Stir in the cooked beans. Stir the stock into the tahini a little bit at a time, stirring to mix them together thoroughly. Add to the pan, cover and simmer for about five minutes. Serve with lemon wedges to squeeze over. I love fresh herbs and I think the easy availability of them in supermarkets is one of the best changes that has happened to the food culture in this country over the past few years. Dried herbs have their place, but the dusty remains of dried basil from a jar may as well be from a different species compared to the aromatic leaves of fresh basil. Having said that, fresh herbs aren’t cheap, averaging about 80p for 28g. If you’re living on your own or as part of a couple, buying fresh basil for one meal means that you’re going to waste most of it as, even in the fridge, the packet will be heading towards sileage by the end of the week. Luckily you can freeze some herbs, and I’m not talking about the women’s magazines chop-them-and-put-them-in-ice-cube-trays trick. I keep my ice cube trays for ice cubes for my gin and tonic, thank you, but I still manage to freeze herbs. Before you start freezing herbs, you need to think about what freezing does to a plant. When a plant is frozen, the water in its cells expands and breaks through the cell walls that give the plant its structure. This means that frozen plants will go limp and soggy when they’re defrosted. So herbs either need to be robust enough to survive this freezing onslaught or you were going to present them as limp and soggy anyway. Think about frozen spinach. If you defrost a block of it, you have a dark green, soggy mass. But that’s OK, because that’s how fresh spinach goes anyway when you cook it. There are some herbs I don’t freeze. These are leafy herbs, where I need them to be fresh and leafy not limp and soggy when I serve them. I’m talking parsley, coriander, mint, chives and basil here. I rarely need to preserve coriander – it’s in nearly constant use in my kitchen. I tend to use parsley more as a salad leaf than as a traditional herb, so any sitting in the fridge at the end of the week tends to end up Friday’s take-to-work salad. Chives don’t freeze successfully. In addition to going unattractively soggy, freezing changes mint’s flavour rather like leaving it sitting in hot water too long does. I’ll assume that no one is even going to try freezing basil, it’s a complete non-starter. So if you’ve got half a packet of mint left what do you do with it? I chop it finely, put it in a small sealable pot or box, cover it with oil, put the lid on and store it in the fridge. The herbs should last for three to four weeks in the fridge, depending on how often you open the container. The oil will set a little in the fridge, but will go back to liquid at room temperature. You can then add spoonfulls to soups, stews and dressings, or drizzle over salads and pasta before serving. You might get to the ingredients list of this recipe and wonder if I’ve mistyped it. I promise you I haven’t. That is 2 tablespoons of vinegar to 2 teaspoons of olive oil. 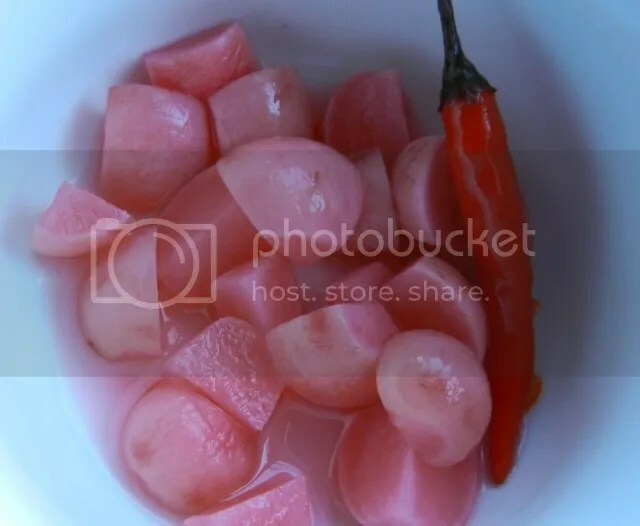 That’s because, when the onions and peppers are roasted together like this, they go incredibly sweet and you need the acidity to cut through that sweetness. I used vinegar here, but the juice of a lemon would be great too. This is a good recipe for use up any red (or other coloured) peppers that are beginning to go a bit wrinkly in places. Note I haven’t removed the skin. The idea isn’t to roast them to the stage of blackened skin, but just to soften the flesh and toast them a bit. Put the vegetables on a roasting tray, rub with the 2 tbsp of vegetable oil and season well with salt and pepper. Roast for 30 minutes until the vegetables are cooked and a little brown round the edges. In a large bowl, mix the vinegar, olive oil and capers together and season with salt and pepper. When the vegetables are cooked put them in the bowl with the dressing. Toss in the dressing until all the vegetables are coated. 4) Farting. It happens. If you’ve gone vegetarian the chances are you’re adding more fibre to your diet and your digestive system has to get used to not having meat to work on. This can produce gas and you may notice that you’re moving to some of the higher numbers on the Bristol Stool Scale. If you think things are moving too quickly as it were, try white bread, rice, potato and pasta as the carb content of meals to calm things down. Generally people are advised to drink more water. Mint and fennel teas can also help as they’re well-known herbal digestive remedies. In extreme cases try something like Colpermin or other over-the-counter remedies for irritable bowel syndrome. As your gut adjusts to your new diet you should find the symptoms decrease. Of course, if you get worried, go see your GP about it. 5) Feeling hungry. This is pretty normal. Your body is used to you eating in one way and now you’re presenting it with another. The eating patterns that used to work may not satisfy you any more. You might have to switch from three big meals a day to four or five smaller ones. I have found that I generally need a snack about 4pm most days. There is also some evidence that eating olive oil can help you feel full. Also, keep an eye on your nutrition. You don’t need to turn into a qualified dietitian, but try and make sure you’re covering the bases over the course of a week. In my opinion, it’s impossible to eat too many green leafy vegetables. Oh, and don’t worry if you don’t suddenly feel more alive and bursting with energy after going vegetarian. I’ve seen that promise made several times on various vegetarian forums. It never happened to me. It doesn’t happen to everyone and you’re not doing it wrong if it doesn’t happen to you. 6) Being the only vegetarian in the village. Some studies have put the number of vegetarians in the UK as about 10% of the population. That’s a sizeable minority, but it is a minority and it’s easy sometimes to feel alone in this new venture in your life. There are vegetarian and vegan groups that meet up regularly. The Vegetarian Society, The Vegan Society and Viva! all have groups listed on their webpages. 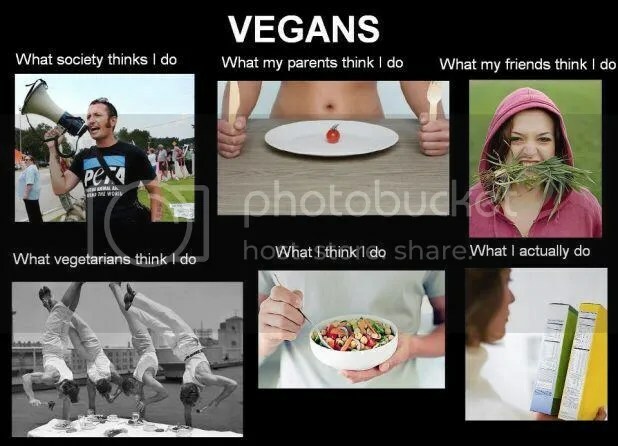 If, like me, you’re not that into groups then there are plenty of vegetarian/vegan communities and forums on the internet where you can find advise and contact. Also, look out for vegetarian/vegan festivals -the biggest are Veg Fest but you can also find local ones out there as well. That’s it for the advice. Good luck. Being vegetarian/vegan is a good thing to be for yourself, for animals and for the planet. It’s well worth persevering with and if you need advice or general pompom waving please ask in the comments. And enjoy it! It shouldn’t be a penance. It’s OK to laugh and have fun along the way.